Last Sunday, the 29th March, I went with a number of friends to the National Portrait Gallery in Canberra, ACT, Australia to view their current works. 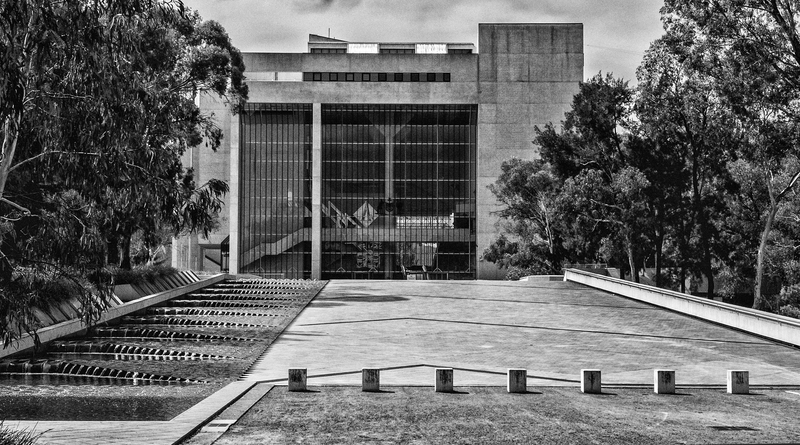 The N.P.G stands near Australia’s National Gallery, the High Court of Australia and other significant buildings that are situate in our Nations Capital. The High Court building is an interesting structure with it’s glass facade, sloping forecourt and water feature. At the time of making this image, the light was quite harsh with strong reflection from the concrete forecourt and the massive amount of glass. I made several images before getting the exposure right. I hope you like the result. I made this image using my little Leica D Lux 6 , a very handy piece of kit to use on outings like this. I’d used it the evening before and had set the ISO at 400 as I was shooting indoors without flash. It wasn’t until I downloaded Sunday’s images and noted the noise that I realised I hadn’t taken the ISO back to 100 for the daylight shots. No excuses, just stupidity on my part. For the technically minded, for this image I set the aperture at f8 to give adequate depth of field, shutter speed 1/1000th second and of course, that ridiculously high ISO of 400. The image was converted from colour to monochrome using NIK’s effective Silver Efex Pro 2. Well, for me, only one more day to go before the 5 day challenge ends. There are so many great photographers out there it’s hard to choose one to take up the challenge. I’m working on it!